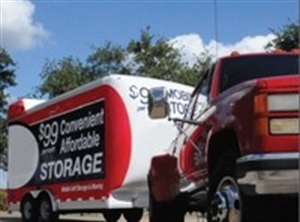 This leading mobile storage franchise represents a disruptive business and operating model within the mobile self storage and moving industries, providing an innovative, efficient, high-quality, proprietary mobile storage and moving platforms that offer significant economic and operating advantages over competing technologies. System fully addresses the requirements of changing consumer preferences within the moving and storage industry and has the potential to be a game-changing offering. The System, compared to other systems: (i) has lower upfront and maintenance capital requirements and variable operating costs; (ii) offers a potentially dramatically higher return on capital invested in franchises; (iii) provides a superior or competitive product and service offering; (iv) allows franchisees to compete on price or achieve profitability at lower customer volumes while maintaining superior profit margins; and (v) can improve the revenue potential of a territory given that it is easier to deliver to consumers in challenging, heavy vehicle restricted locations. Additional benefits of the System for franchisees include: (i) an additional revenue stream through the sale of additional products and services, (ii) the ability to make faster drop-offs and being able to serve market areas that are off limits to competitors due to restrictions prohibiting the placing of unregistered containers on the street, (iii) the ability to employ drivers that are not required to have a class “C” license and lower-cost driver labor, thereby eliminating the need for specialized training of employees and reducing the cost of turnover; and (iv) reduced risk of accidents due to the simplicity and standardization of equipment being employed. Buyers must have a minimum net worth of at least $250K. In addition to the purchase price, buyers will need about $90K in working capital to lease storage space, fork lift, pickup truck, and pay for marketing and misc. equipment. $67K of the initial $155K can be financed at ZERO down for 5 years. Location and Facilities: The franchise will help you lease available storage space for your business. Price includes territory of 400K people. Franchise fee is $14K per 100K people and is flexible based on your area and goals. Support/Training: Strong training and ongoing support provided. There are 3 different elements to the initial training. All are done at the franchisees location: Logistics, Marketing, Technology. Market Information and Position: This franchise has many cost advantages over competing technologies such as those of industry pioneers PODS® and 1-800-PACK RAT® Up to 50% less expensive than competing storage concepts. Easy to expand. Add territory at $14K per 100K population. Add storage units at $1850 each which can be financed. The franchise can finance the cost of your storage units with ZERO down for five years. We can help unlock your 401K without penalties to use to buy your business.